While hunting Taira no Koremochi came upon a princess and her attendants in the woods at Togakushi Mountain. At their invitation he joined them, and after feasting and drinking fell asleep. In a dream he was warned that the princess was in fact Kijo, a demon, who intended to kill him. Waking, he saw the demon and, drawing his sword, killed it. If you look closely at the center of the print at the sleeve of Taira no Koremochi's robe you will notice a butterfly motif. The butterfly was one of the family crests or mons of the Taira clan. This is not just a decoration, but an identifying motif. 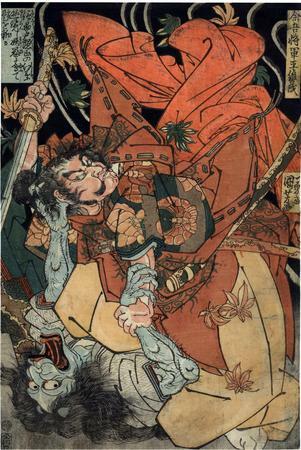 Note that the butterfly crest does not appear in all images of Koremochi and the demon woman. Not even all of those composed by Kuniyoshi. The text in the cartouche in the upper left reads: 信州戸隠山の紅葉遊覧し妖鬼に會て是を斬る.